This fun fall pumpkin craft will make a great addition to your preschool classroom! 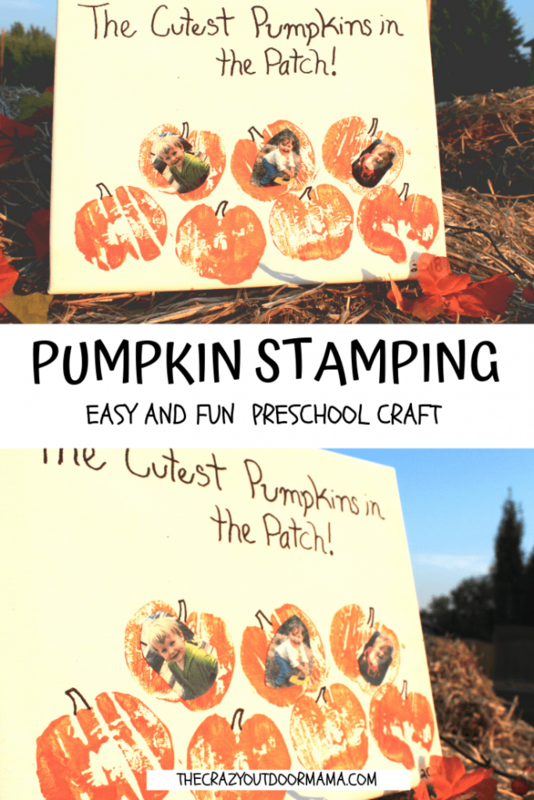 If you’re looking for a fun pumpkin craft to do with your preschooler, you’ll love this apple stamping pumpkin art! This fall pumpkin craft is fun for preschoolers, and you can totally make it into a gift, or make it a classroom project! While working on my other pumpkin craft this year, my toddler kept on asking to make a pumpkin. There weren’t any for sale yet in the area (I was doing my craft in prep for the Halloween season!) and I’m way too much of a perfectionist to let him paint his own mason jar… I know, I need to let go of that! Anyways, I told him over and over that I’d think of a craft for him to do. Finally, he called me on it after 2 days of telling him that so I had to think quick! I looked around the kitchen, looking for something pumpkin shaped, and saw my mom’s cute little apples! I thought about it for a minute, and realized they would make adorable little pumpkin stamps if they were cut in half! My toddler loved it, I loved it, and we turned it into a cute memory of our fall by adding some pictures onto it! P.S. If you’re looking for other fun fall stuff to do with your toddler, check out this list of 9 fun fall toddler activities they’ll LOVE as much as you do! 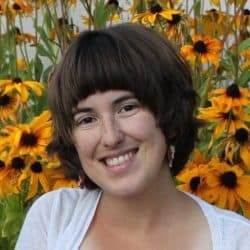 Optional (but worth it!) 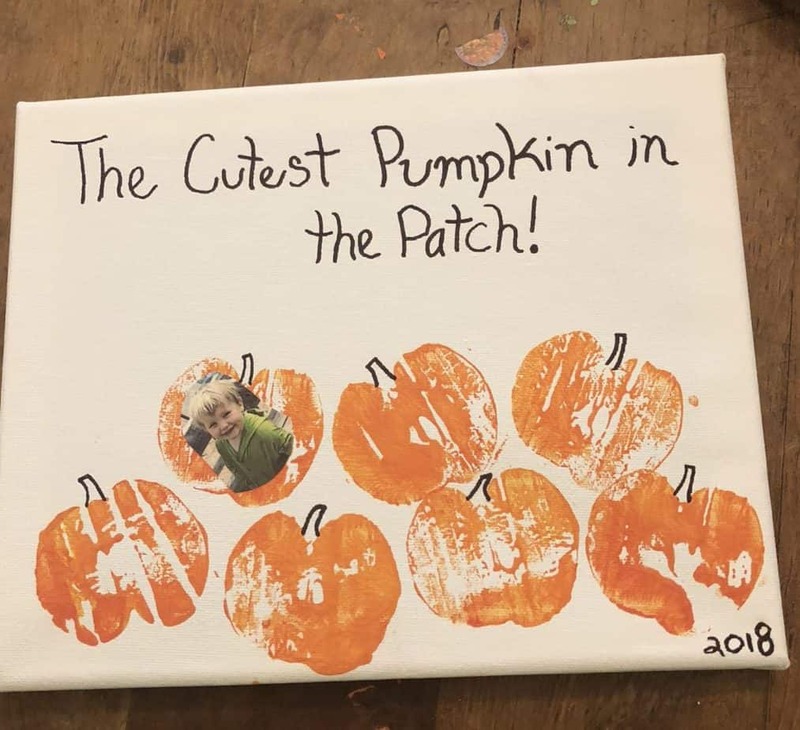 pictures of your cute kids to put on the pumpkin! Cut the apple in half – Cut it from the stem down, I think it’s a better pumpkin shape! But that is just what worked for my apples, do what’s best for yours! If you want a more ‘pumpkiny’ look, make super shallow vertical cuts to create the “lines” hat pumpkins have! 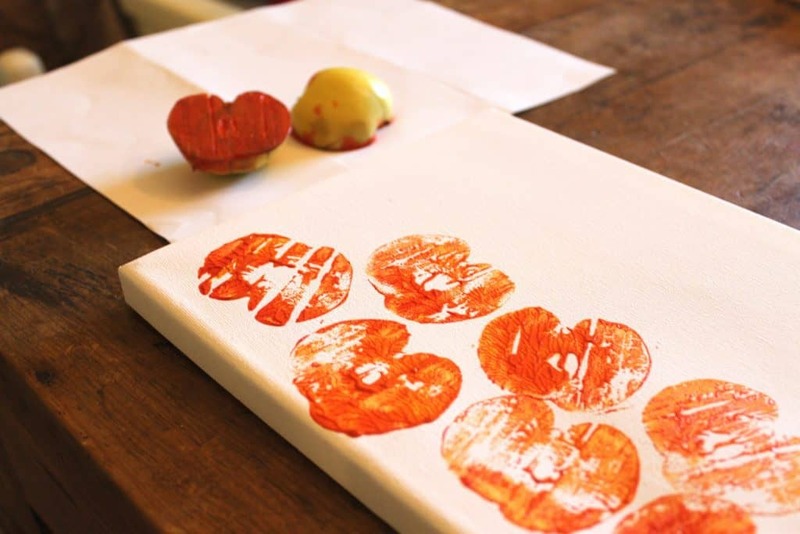 Using the apple as a stamp, dip it in the orange paint and stamp it onto your paper! For better results, you may want to get some of the extra paint off on a scratch piece of paper so that it comes out better. If your toddler (mine is 3) is doing this, just let them enjoy it because it likely won’t turn out like this picture. HOWEVER, they will totally have a blast using an apple to turn it into a pumpkin! This is a great way to use rotten apples! Cut them in half, add a couple of slits, and stamp away! Write your wording on the top of the paper – I wrote “The cutest pumpkins in the patch” because I have 3 kiddos! 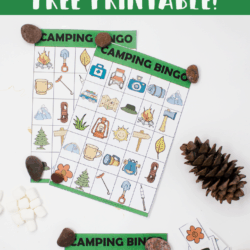 This would also work great if you are a teacher doing this Halloween / fall craft with your preschool class, or a parent making a gift for grandparents for Halloween! Add stems and pictures – This is the icing on top! The stems totally give it a more pumpkin-y feel, and the pictures make it adorable! You can leave out the pictures, but they add a whole other cuteness factor! I actually used an apple that was bad, and so really enjoyed being creative with my preschooler with thinking of how to repurpose bad food! If you have apples where you live, you may run into quite a few that have worms in them. If you cut them open, they’ll sometimes have a cool design from the worm that will add to the uniquenesses of the craft! If you have a class of kindergartners, someone might love for you to clean up all the apples on the ground by their house! And the kid will love to each of their own apple stamp! If you’re interested in more pumpkin crafts, check these out! My mason jar pumpkin patch craft – perfect for busy families who don’t have time (or their kids are too squimish) to deal with pumpkins! This wooly bugger craft is adorable! A fun fall craft idea – make some stained glass leaves! Have fun with some leaf crafts that are mess free for your toddlers! This pumpkin craft will be a great way to remember halloween! 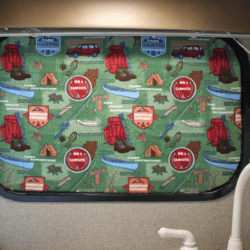 An awesome fall leaf placemat! !